While the Sibley chart for the USA suggests a potential for a steady decline of American liberty, the rise of libertarian ideology in recent years is hard to miss. For decades after the fall of Goldwater (not actually a libertarian, but close in certain respects) it seemed as if America were doomed to choose between the Scylla and Charybdis of the statist Left and the statist Right. Government grew unbounded and no real resistance appeared (despite the promises of Ronald Reagan). Then, as the 2008 presidential election reared its bloated head, a ray of light. Ron Paul's quixotic run for the office began, and gathered internet-powered steam far faster than anyone could have anticipated. The libertarian remnant awoke from slumber. Disaffected liberals (myself included) shed our Leftist allegiances and found new hope in the ideals of non-aggression and freedom. Millions of American youngsters discovered an ideological alternative to death by socialism versus death by war. Two Ron Paul campaigns later, we still have the largest, most militaristic and bloated state in the history of the world... but we also have hope (and not the false kind). A libertarian-leaning wing of the Republicans (led by Rand Paul and sometimes Ted Cruz) has taken root and captured the popular imagination. The American anti-war segment has, perhaps for the first time ever, stopped a war before it started. Marijuana is legal in several states, and Americans are resisting surveillance and gun-control legislation en mass. Bitcoin now offers an alternative to the economic horror of state/central banking which cannot be stopped with physical force. Astrologically, to explain such a movement, we would be looking for a very slow-moving factor such as progressions... involving Pallas. 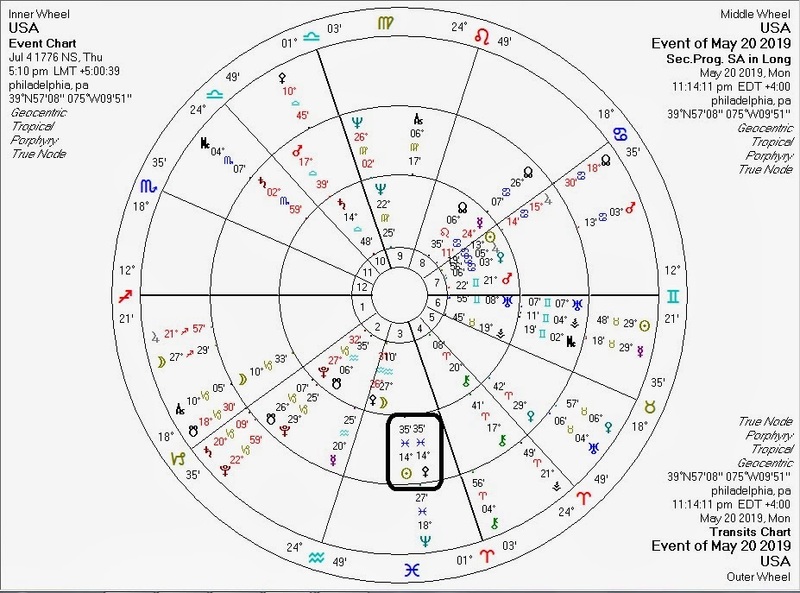 This first chart is for transits and progressions against the USA chart on the day Ron Paul announced his 2008 run: arguably the birth of the current libertarian resurgence. 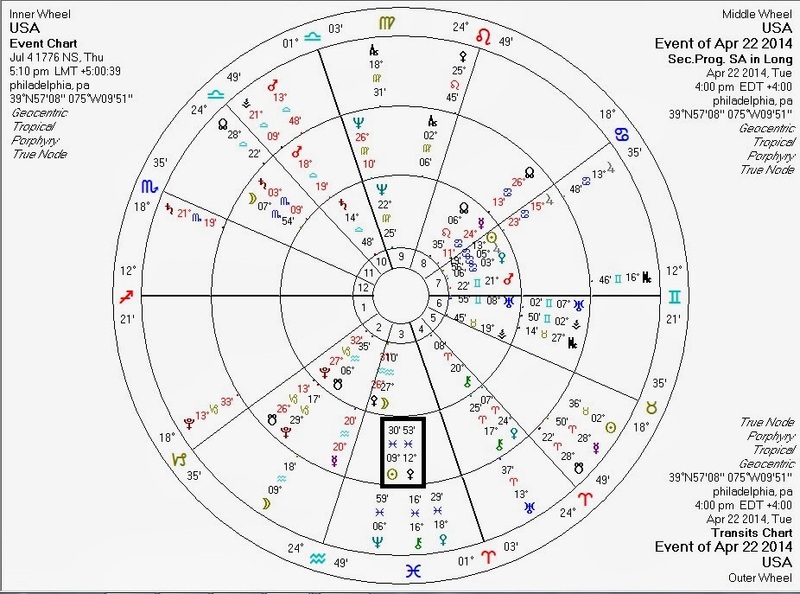 Transiting Pallas and both the transiting and progressed Mercury are conjunct the USA Pallas for this chart -- both excellent albeit transient indicators for libertarianism. The harbinger of a long-term movement is that the progressed Sun has just entered within eight degrees of the progressed Pallas. Eight degrees is the standard (conservative) orb for a conjunction, and because the Sun progresses faster than Pallas, we are looking at the beginnings of a long-term libertarian emergence. 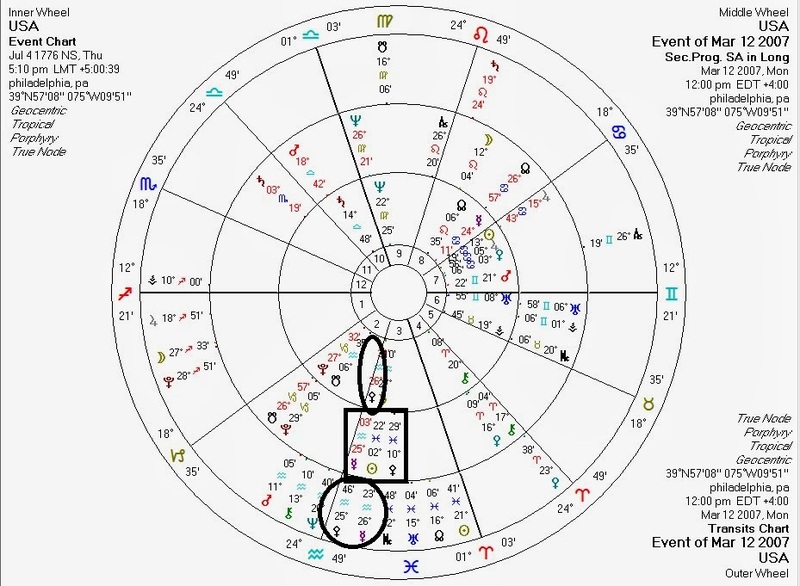 This second chart marks progressions and transits against the USA chart for the coming grand cardinal cross next month. Note the progressed Sun-Pallas conjunction is much closer. Between this chart and the previous one, the US has seen the rise of a true libertarian political bloc with its own media and even its own currency. This third chart shows the peak of the Sun-Pallas progressed conjunction, five years from now. While the Powers That Be will do their best to retain fascist-style control, they may find it increasingly hard to do so in America in this decade. As the Sun-Pallas progressed conjunction tightens, the American libertarian movement will in all likelihood gain even more momentum. It is the task of all peace-and-freedom loving Americans to make the best of these energies while we have them.